Question: Does your company regularly consider the 5 W's? Who, What, Where, When, Why (and How)? Seems simple really - but at Sequence, we believe that this is the recipe for our ongoing success. 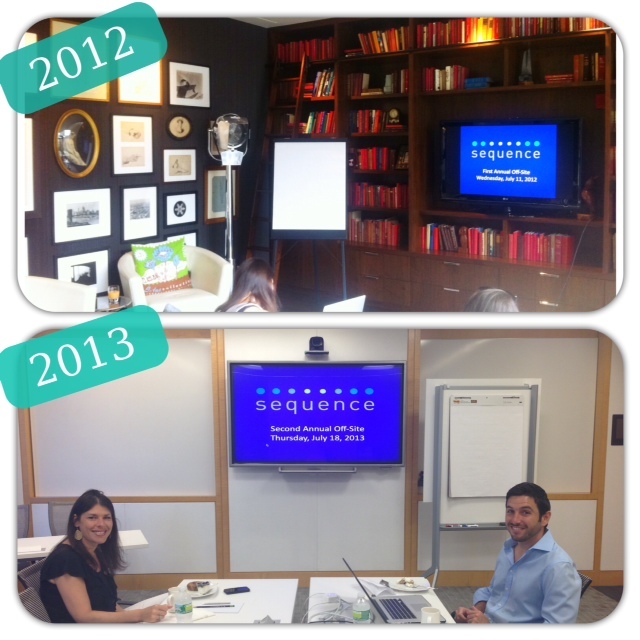 Just this last week, our team got together for it's second annual SEQUENCE SUMMIT. What is a Summit you ask? Well, it's our version of Judgement Day. It's our golden opportunity to openly and honestly critique and collaborate on the performance of our company and in only a few years, we have seen the fruits of this initiative. We make a point to reevaluate the 5 W's of our company, reflect on the last year of business, brainstorm and project for the coming year and implement realistic plans to achieve our goals. *SEQ Sidenote: It certainly doesn't hurt that we get to leave the office and brainstorm in a modern-chic setting like Convene (with bottomless brain food to boot-- like fresh cappucinos, wasabi peas and York peppermint patties - -- hey, don't judge --- this is SEQ brain food). What do you or your company do to recharge the batteries and get geared up for another year? How do you stir the creative juices and keep things fresh? We suggest you try a Summit - "it does a body good". **Big thanks to Convene (formerly Sentry Centers) in the Financial District for providing such amazing accommodations -- without your helpful, relaxing, accessible, and friendly meeting planning services- our 2013 Summit would not have been nearly as successful!